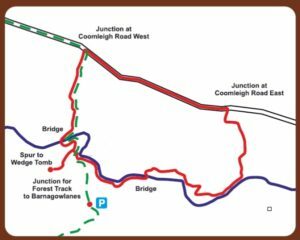 We have opened a 3.5km loop walk in Mealagh woods, with most of the route through pleasant deciduous woodlands of ash, sycamore, beech and oak. 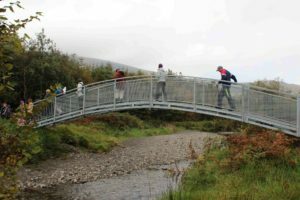 The walks takes you along the Mealagh river, with two bridges, and there is a short stretch along a very quiet road. 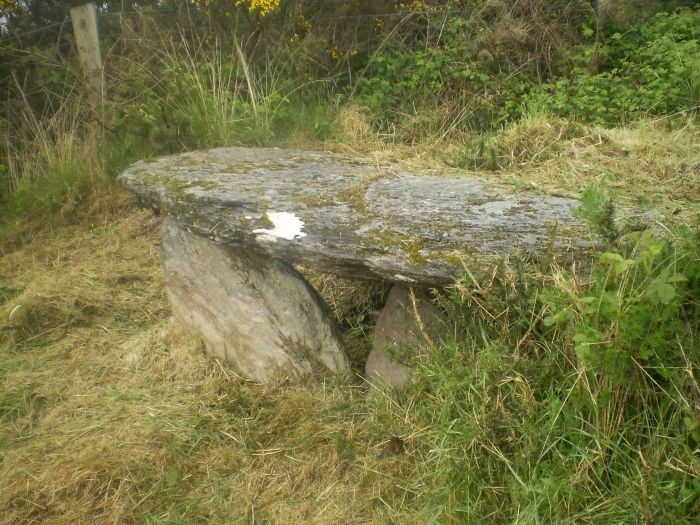 The walk is suitable for family strolls or dog walking, and along the route you will come to a 400m spur walk bringing you to the Barnagowlanes Wedge Tomb which dates back 4,000 years or more. The walk will take 45 minutes to 1 hour. The walking grade is “easy” but we suggest wearing wellingtons or boots if there has been recent rain. The walking loop route is anti-clockwise marked with orange paint on trees and/or arrows. Part of the route is also marked with yellow marks for the Sheeps Head Way, or with other marks for St. Finbarr’s Way. During heavy rain, and for a short while after, the area around the river can flood. If the ground is flooded, please do not attempt to complete the route. Please return the way you came to your car. There are two car parks, one on the north side of the valley and one on the south side. If you use “Google Maps” for directions, please click HERE for directions to the southern entrance at Barnagowlanes or HERE for directions to the north side car park at Coomleigh. If you prefer old-fashioned Ordnance survey maps, you will find a road map to the start points if you click HERE. (Links will open in a new window). Travelling out of Bantry, turn right after the Quickpick shop. Drive past Co-Action and take the next left. Travel about 9km and you will see a road on your left with a green signpost showing walking route to Kealkil. Follow the walking route markers down a forest track to a car park. From the car park, follow the yellow walking marks until you get to the river. There is a map-board at the river which will show you the walking route. From Bantry, head out the Glengarriff Road, past the Topaz filling station and take the next right. Follow the road for approximately 11km until you come to a car park on your right side. Park here and you will find a map board explaining the route.